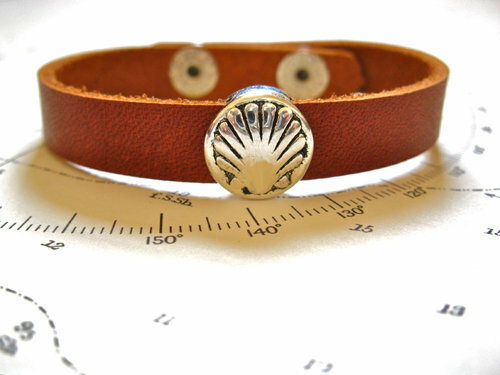 This concha-shell charm bracelet, handmade of natural leather, features the scallop shell symbol of El Camino de Santiago - the Way of St James pilgrimage across Spain . . to the great Cathedral in Santiago de Compostela, Galicia. Narrow, and simple in style in line with the principles of El Camino: A charm bracelet with real meaning. Dimensions: At 10mm wide, this neat leather bracelet is quite narrow. Do you want to encourage and support your friends or loved-ones as they walk life's camino and face its challenges? Let us send this hand-crafted leather bracelet on your behalf to show how much you care - a symbolic Camino bracelet. The 1,000-year-old Way of St. James (El Camino de Santiago - in Spanish), criss-crosses Western Europe, arriving at Santiago de Compostela in Northern Spain on the Atlantic coast. At least 150,000 people travel to the city each year from all over the world: Some people walk, others travel by bike. Many travellers choose to do the Camino for personal, rather than any spiritual or religious reasons - taking time out from their busy, modern lives and perhaps finding inspiration along the way, whilst reflecting on their lives in a supportive environment. Many carry with them a Scallop Shell or St James Cross. Everyone experiences the journey in a different way. Show someone that you really care and that you are thinking of them with this lovely Camino bracelet. Comes gift-wrapped, like all our presents - and we can print a personal message on your behalf.